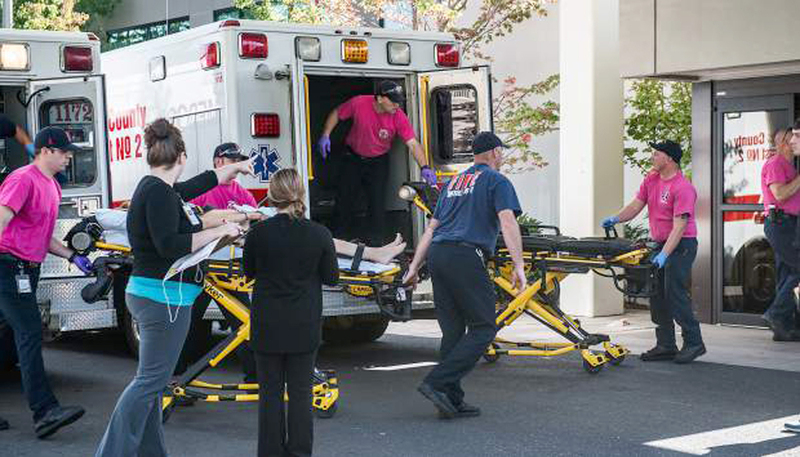 10 Dead And 7 Injured In Oregon College Shooting, Officials Say : The Two-Way Officials say the shooter died in a gunfight with police at Umpqua Community College on Thursday. President Obama expressed his frustration that such mass shootings have become "routine." A patient is wheeled into the emergency room at Mercy Medical Center in Roseburg, Ore., following a deadly shooting at Umpqua Community College in Roseburg on Thursday. After a shooting at a community college in western Oregon, 10 people are dead and seven others are wounded, according to the Douglas County sheriff. Officials would not say whether the shooter, who was killed by police in an exchange of gunfire on campus, was included in the 10 fatalities. Counselors are available for UCC students, staff and their families who need them at the Douglas County Fairgrounds - Douglas Hall. 3 victims from #UCCshooting are being taken via helicopter to PeaceHealth Sacred Heart Medical Center in Springfield, OR, hospital confirms. In a evening news conference, Sheriff John Hanlin said that investigators believe they know the name of the attacker, and it will be released by the medical examiner. Several news organizations quote government and law enforcement sources as saying the shooter was Chris Harper Mercer, 26. NPR has not independently confirmed that identification. President Obama spoke about the shooting Thursday evening, offering his condolences to the victims and their families before expressing frustration over the fact that mass shootings in America have become "routine." The incident happened at Umpqua Community College in the city of Roseburg. In an afternoon news conference, Hanlin said after receiving an emergency call, officers responded and "engaged the suspect. There was an exchange of gunfire, the [male] shooter was neutralized," he said, adding that the shooter was deceased. He said he did not know what type of weapon was used nor whether the shooter had been a student at the college. Later, Hanlon said the officers who engaged the attacker were heroic, and the state police were handling the investigation of the officer-involved shooting. Listen to Brady Winder, a student at the community college, describe what it was like to be in the classroom next to the shooting. He said he never "ran that fast in [his] life." "The shooter ... told people to get on the ground. The shooter was asking people to stand up and state their religion and then started firing away, Moore said. Moore was lying there with people who had been shot." Reuters quotes an unnamed college employee as saying that students "came in running ... we went into lockdown." In audio of the emergency call, a dispatcher is heard saying that at the college's Snyder Hall, "Somebody is outside one of the doors shooting through the door. A female is inside the computer lab. We do have one female that has been shot at this time." The AP says that the college in Roseburg has about 3,000 students. The school's website was down Thursday, and a phone message wasn't immediately returned. In a news conference, Obama urged Americans to support "common sense" gun laws and pre-empted critics who might accuse him of politicizing a tragedy by saying that gun safety "should be politicized." Obama said that the idea that the Constitution prohibits any modest regulation of how deadly weapons are used doesn't make sense. This is a breaking news story. We'll update this post with developments.